On April 27, 126 teams set out from Gettysburg, PA, with an objective to reach Washington, DC by the end of April 28. The catch? The 200 mile route must be traversed on foot. Like the many patriots who once marched through the Civil War battlefields, across the Mason-Dixon line, and through the back roads of our beloved nation, every runner attacked the route with nothing other than pure human locomotion. This is the American Odyssey Relay. 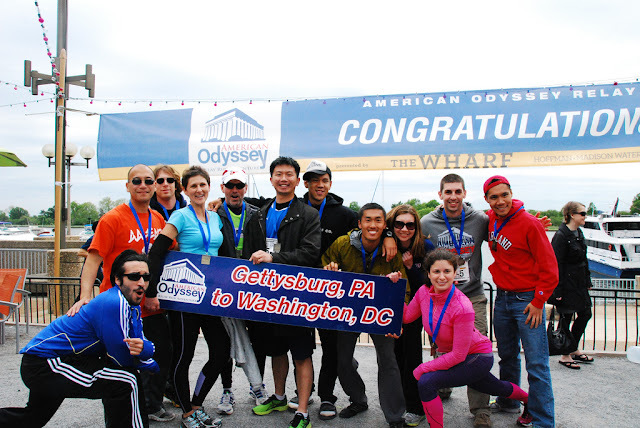 The American Odyssey Relay (AOR), like many other running relays, consists of a roughly 200 mile route which is divided into 36 legs of varying distance and difficulty. Each team of 12 runners sends one runner out at a time, with each runner handing off to the next at predetermined transition points. The race clock doesn’t stop until the last runner crosses the finish line, which means everyone runs through the night and into the morning. In total, most teams spend 24-36 hours to complete the distance, often with little to no sleep at all, but with wonderful memories to share for a lifetime. This year, PTO runners Lisa Lewis, Karen Dean, Andrew Polay, Alex Vu, Yin Tsai, Shannon Twohig, and Eugene Wu, along with non-PTO Vince Lam (Team Captain), Tim Smith, George Lam, Xavier Gascon and Ken Schoppmann, represented team Will Run for Snickers. The Snickers team fought through many challenges along the course, including several injured knees and ankles, grumpy competition, and a malfunctioning bubble gun, but still never stopped cheering for every single runner on the road. Snickers finished with a time of 29 hours and 44 minutes. Another PTO runner, Becky Fritchman, with team American Odd & Easy, took the Open Mixed title again with an impressive finish time of 24 hours and 22 minutes. American Odd & Easy could be seen and heard at every transition point with ballerina tu-tu’s and Captain America paraphernalia, spreading joyous running spirit to everyone. Notably, Matias Palavecino, husband to PTO employee Katie Palavecino, and inaugural PTO 5k champion, took overall 1st place with the Bucknell Alumni Distance Team, finishing in 19 hours and 25 minutes (this corresponds to a sub-6 minute mile pace the entire race)! Congratulations to all AOR finishers!